An inflatable rental business can be very exciting and rewarding. It can be tricky finding out where to buy inflatables. You may initially think they are all the same. In fact, there can be a world of difference between inflatables sold by different companies. Two inflatables may look the same, but they are probably not made of the same quality. Before you make a decision about where to buy inflatables, take a look at our buyer’s tips below. Where Are the Inflatables Made? Many inflatable manufacturing companies advertise that their inflatables are made in the USA. The problem is, not all of these companies are being truthful. Units that are important from other countries are usually cheaper, so they don’t last as long and are not as safe. In addition, these companies are not able to cover the units with a warranty to cover repairs. 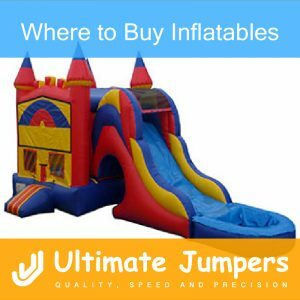 Ultimate Jumpers, Inc. has been in the inflatable manufacturing business for almost a decade. We offer all kinds of inflatables that are backed with a warranty. This is because our inflatables are made with the highest quality vinyl, making them durable and reliable. How Are the Inflatables Made? There is a lot of effort that goes into constructing a high-quality inflatable unit. At Ultimate Jumpers, Inc. we use 18.5 oz vinyl for all of our units to ensure quality. All the stitching throughout the entire unit is done in double or more rows. Every unit is put up and inspected thoroughly to make sure that it meets our quality standards before it is shipped out. After all, what’s more important than a child’s safety? Think about the future of your business. Do not spend money buying from a manufacturer unless you are completely sure that you know what you’re getting.